George at the Behold the Geek! 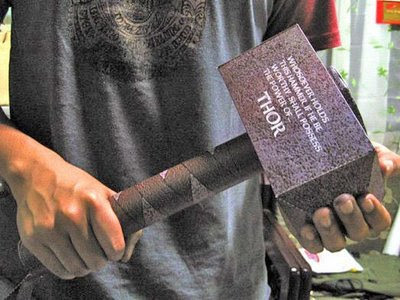 comics blog doubled the size of my 1:2 scale Mjolnir papercraft template to create a full size (1:1 scale) version of Marvel's vision of Thor's mystical hammer. Nice work George! 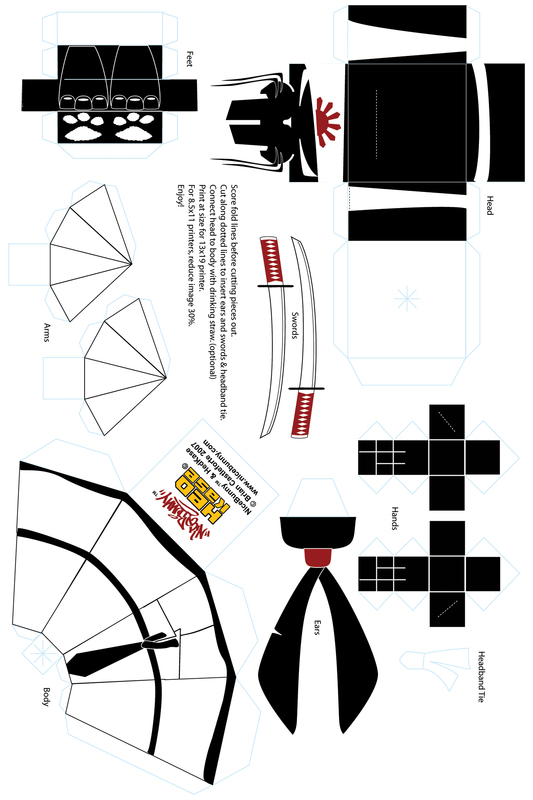 I am hoping to post more Marvel Comics papercraft designs in the future. 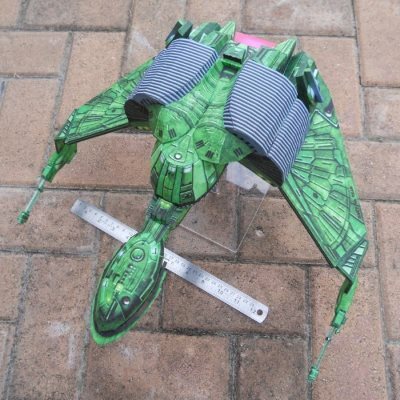 My current Marvel work in progress is a 1:2 scale version of Blink's quiver from the Age of Apocalypse storyline. 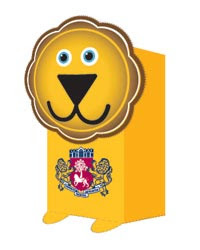 Here is a simple, two piece papercraft lion coin bank. It makes a perfect project for young children just learning the ways of papercraft and when finished, they can use it to store their allowance. This bank is offered by the Practice Loan Company on their website here. As you might guess by the coat of arms on the lion's tummy, the company is located in England. Thanks Andy for letting me know about this one! The template for this Herbie the Love Bug papercraft was originally published in a 1974 issue of a German Disney magazine for kids. I couldn't locate a picture of the finished model, so assembling this Beetle was largely a matter of trial and error. The template has four pages and if it were printed one page per letter size sheet the resulting model would end up being about 10" (25 cm) long. I chose to print two template pages per sheet which gave me a final model about half that size. A download of the template can be found here. Pictured in the upper left corner is a basic two inch (5 cm) cube which can be created without glue from six standard size business cards. These basic cubes, by interlocking the flaps on the sides, can be connected together to form larger constructions. 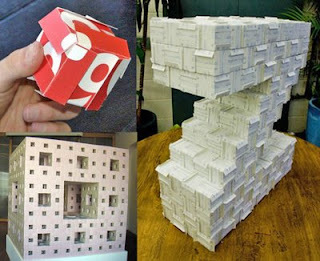 On the right is a letter "Z" built by Sam Allen using 2,400 business cards. In the lower left corner is a depth three Menger’s Sponge built by Doctor Jeannine Mosely using 66,048 business cards! You will notice that the surface of the Menger's Sponge is flapless compared the surface of the "Z". A flapless cube may be constructed by adding business cards with the flaps turned inward to each of the six faces of the basic cube. Excellent illustrated instructions by Ned Batchelder on how to build the basic cube as shown in the upper left can be found here. Details on the construction of the "Z" can be found here. And finally, the story on the Menger Sponge construction can be found at The Institute for Figuring website which also offers instructions here that illustrate nicely how to create flapless cubes. Inside the Final Fantasy X-2 video game there is a mini game called "Sphere Break". Sphere Break is a Sudoku-like, math based game that uses coins as part of the game play. There are 64 different coins used in the game, each of which has a different picture of a Final Fantasy character. Pictured above is a sampling of some of the coins. On the front row, from left to right, is a Cactaur coin, a Tidus coin, and a Chocobo coin. 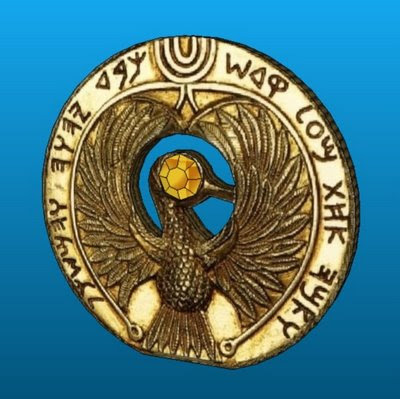 The second row shows the typical pattern on the back face of each of the coins. Papercrafter's Haven has created papercraft versions of all 64 coins which are available here. Each of the papercraft coins measures appoximately 1 1/2" (38 mm) across and are about 1/8" (3 mm) thick. 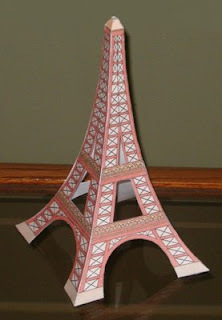 Here is a simple yet elegant papercraft of the Eiffel Tower in Paris. It is 8 inches (20 cm) tall and has only four parts. According to Agence Eureka, the blog where this papercraft can be found, this particular template was produced in 1934. The French instructions included with the template say to paste the parts on "strong, but flexible" paper implying that it was originally distributed on thinner paper, possibly in a book or magazine. Thankfully today, with the invention of the computer and printer, we can skip the pasting step and print a scan of the template directly onto heavy paper. A copy of the template for the tower can be found here. This Hulk Hogan mask I came across was just too amusing not to mention. While it is not exactly 3D papercraft, it is made to be printed on your home computer and cut out. 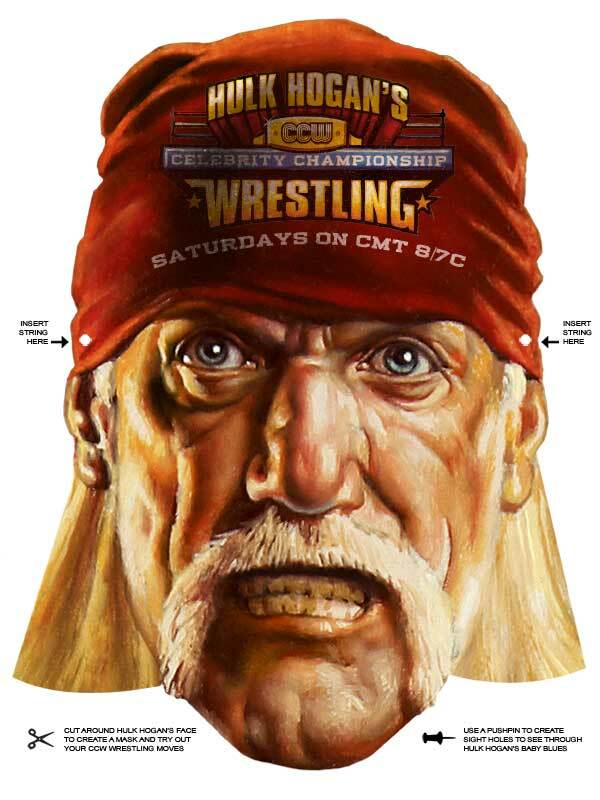 This painterly mask is a promotional "toy" for Hogan's celebrity wrestling show and is available on the CMT cable network website here. 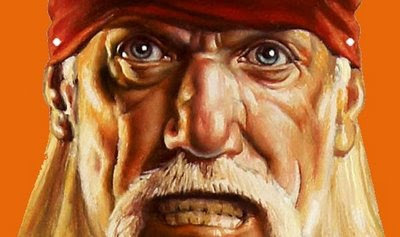 And as you don your new mask, little Hulkamaniacs, remember what the Hulkster said: "say your prayers, take your vitamins and you will never go wrong!" This past October I built some papercraft animals for my daughter's birthday cake. As to not show favoritism, when my two sons celebrated their birthdays this weekend I built them some cake toppers as well. 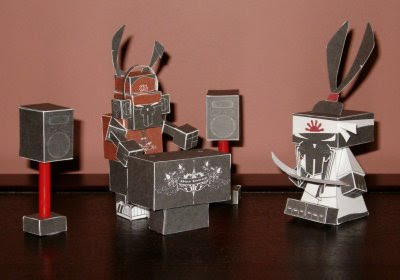 One son aspires to be a DJ someday and the other is a fan of all things Samurai so I chose to build two NiceBunny papertoys by Brian Castleforte, USA. On the left is a NiceBunny DJ, 2006, which can be downloaded here. And on the right is a 2007 NiceBunny Samurai from the "Hedkase" series which can be downloaded here. 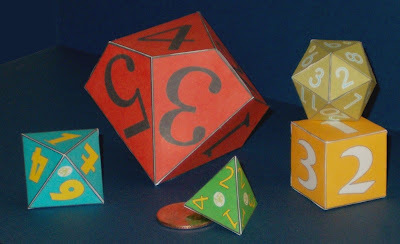 Bruno Van de Casteele at www.puam.be has created a series of ten paper dice for use in role-playing games (RPG). The dice designs range from a two sided die all the way up to a pair of ten sided dice that can be used to simulate the roll of a single one hundred sided die. Five of Bruno's designs are shown. From left to right, following the notation common in RPG systems, the dice are a d8, a d10, a d4, a d20, and a d6. If the dice templates are printed without modification, the resulting dice come out rather large as can be seen by the size of the red d10 (I have added a quarter to the photo for reference). I was able to get a smaller scale on the other four dice by printing two templates per one sheet of cardstock. Downloads of the templates are available in both PDF and GIF format. I ran across this bad boy on deviantART and couldn't resist building him. At 6 inches (15.2 cm) tall he is a good head and shoulders above most of the other papertoys I have built. I keep thinking I should maybe store something in his tray-like lower jaw like some M&M's or some Skittles. :) Simply titled "Red Creature 2.0", this papertoy was designed by Alex Rietveld, Netherlands, 2008. The template for the monster can be downloaded here. 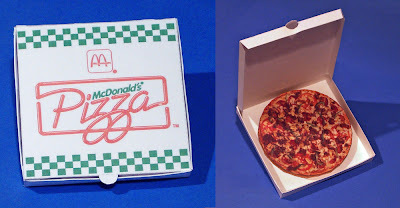 Remember when McDonald's served pizza? Uh, me neither, but there are quite a few people out there who do. 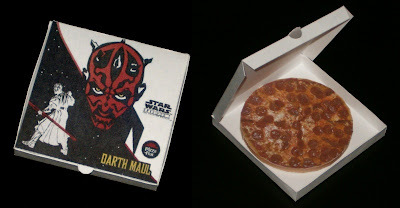 Apparently, in the US and Canada McDonald's pizza was only available in limited locations. How long was McPizza around? It's hard to say. The New York Times reported in September 1989 that test marketing had begun, while others reported pizza sightings as late at 1998. Be that as it may, this is my paper toy homage to a fast food experiment I missed. It is an easy build with only three parts, just the quick diversion you need on a boring afternoon.